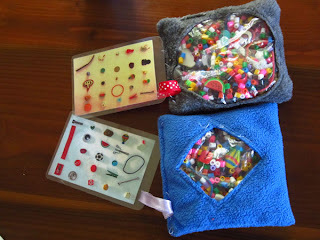 I loved the look of these i-spy bags that are everywhere in the Internet. My kids thought the idea was very interesting, although they didn't really want to spend more than about 20 minutes with it (about the same time as it took me to make a second one). I think it kept my husband and me entertained for longer than the kids. This could be because Mr 4 has great trouble finding anything, and Miss 2 was too young. Or perhaps the coloured beads make it too difficult. The finished objects turned out to be about 10 or 12 cm square. I first made the grey bag bigger (hence the big window) but it was too big for small hands. The big window does make it much easier to find the things inside though. The metal things are particularly hard to find, as they tend to sink down to the bottom of the beads. I used the coloured beads because I had them in house, and also because they weren't a food product, and so wouldn't cause issues going through airport quarantine. I also bought small bottles and some letter beads and made and an alphabet i-spy bottle. 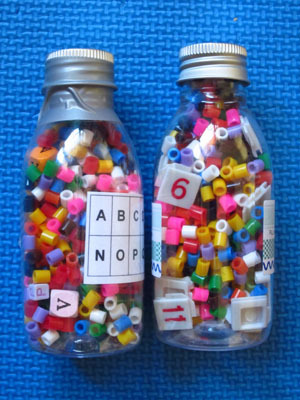 Again, it was too hard for my kids, and so didn't hold their attention for too long; they got far more entertainment out of sorting the letter beads onto chenille sticks and pouring the beads into the bottle. The grown ups played a little longer with it, and then I passed it on to a 4 y/o friend who loves looking for i-spy things and was going on an international holiday.